I just wanted to take this opportunity to write you after I tried your product. I must say, I am very pleased with the results. The coffee I’m drinking is low acid but not a lot of acid has been taken out. The coffee is delicious but even at 30% less acid, I was still feeling the effects of it. I tried another product and it did absolutely nothing for me. Zilch. After trying your product I found that 3 packets for a full cup of coffee works for me. You’re right. It doesn’t change the taste of the coffee at all and I stirred it for the 30 seconds you recommended. Thank you so much! You have no idea how much that morning cup of coffee means to me and not having been able to drink it has been torturous to say the least and I’m not trying to be funny here! Only coffee drinkers would get that! Do you have testimonials on your website? I’d like to leave one. This product really should be in stores to let people know they can drink a cup of coffee again! One other thing I’d like to point out is, you said in your email everyone has to experiment with what their bodies need for their coffee. With the other product I tried, you’re supposed to put one packet in a cup of coffee. Well, since everyone’s body chemistries are different, I don’t think this product is going to work. Not everyone can just take one packet in their coffee and it’s only recommended at one because more than that will change the taste of the coffee according to the owner. With your product, you can experiment with what works best for your body. I like that. Thanks again. I will be ordering again once my “stash” runs out! It has been sooooo long since we’ve been using your products, beginning with Coffee Tamer, and now the CalciBlend Time Delayed Tablets. We told our brother about Coffee Tamer, and he literally can’t live without it. Neither can we. I gave some of the CalciBlend Time Delayed Tablets to a friend who’s suffering from unexplained body aches. I hope she’s ordered a new supply after sampling the tabs. God Bless! Hello, I just wanted to let you know how much coffee tamer has helped me. I have severe Interstitial Cystitis, & had to give up so many foods. Nothing helped. Then, a friend from an IC support group, told me about Coffee Tamer. I use it every day, & carry it around in my purse. I have been able to enjoy foods that I thought I’d never get to eat again. Thanks to Coffee Tamer, I have less pain from foods irritating my bladder. Coffee Tamer has been a lifesaver for me. Please don’t ever change. I don’t have to guess whether or not there might be some hidden ingredient in my food that might make me burn later. I just pull out my handy little yellow case (I keep it on me at all times), & sprinkle a packet on, & I’m good. Thank goodness I found you! Please don’t ever stop selling this product — it is a godsend to those of us who suffer with too much acid. There is NO other product like Coffee Tamer. Thank you for making it available! This product is amazing. I hope you never quit making it. It has relieved my cystitis pain incredibly. Love this stuff. Can’t drink coffee without it and that would be terrible. Thank you and Happy New Year! Even though I take Prilosec for acid reflux, I was unable to drink coffee without getting heart burn. Now that I am using Coffee Tamer, I can enjoy a morning cup of coffee with pure pleasure, and no heartburn. One of the best things that happened to me in 2011 was finding your website and being able to drink coffee again after many years of not being able to! Thank you! For years I fought stomach pain, which was brought on by coffee intake. After using Coffee Tamer for a short time I was able to tolerate two morning cups of coffee without pain. After a few years of Tamer use I believed that possibly I didn’t need the Tamer any longer, however after only a month of no use, my pain returned. I will be a Tamer user for life and highly recommend it! I have told many people about your product and have given many packets of Tamer for people to try and they usually like it and order it. Thanks for supplying this product as it helps me a lot with GERD. I discovered Coffee Tamer a number of years ago in the Vermont County Store catalog. I ordered some and loved it. I love coffee but had never been able to drink it until I found your product ! I can’t live without it, for coffee and other high acid drinks. As always … please continue to offer this product, its a very important part of our diet. I’ve been using Coffee Tamer for a couple of years; I have pretty severe IC and had a love/hate relationship with coffee until my doc told me about Coffee Tamer. 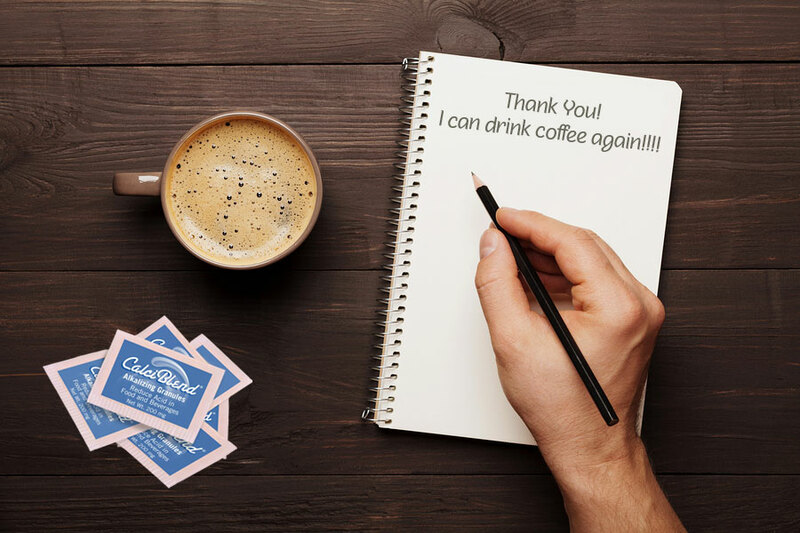 Thanks to you, coffee and I are on good terms again! Best product, in my opinion and the presentations are convenient for travel. My name is Andrea. When I first was diagnosed with I. C. (Interstitial Cystitis), I was given a list of all my favorite foods with the word “no” on it. Then I found CalciBlend and my life changed. My first coffee with no pain in years!! Then I tried pizza, pasta, juice! What a wonderful product! No taste and it takes the acid out, therefore the pain, out of so many drinks and foods. What a blessing, I take my shaker everywhere!